Invite Phillip to inspire your team! Phillip Khan-Panni’s engaging presentations inform, entertain, provoke and lift audiences. You can see for yourself by watching the extended talks he has made available free of charge on his YouTube channel. His speaking style has been good enough to win numerous public speaking awards including UK Champion seven times, Inaugural UK Business Speaker of the Year, (International) Toastmasters Inter-District Chamption, Triple Anglo-Irish Champion and World Silver Medallist. “Because I Tried” will inspire you to focus on the difference you want to make, and to go out and make it. You can see the trailer below, or the watch the full-length video at YouTube. Hear how five simple questions transformed the mindset of his sales team and led to tripling revenue in less than one year. The same questions are relevant to anyone involved in advertising, marketing and new business development. This speech could be the turning point. In this lively and informative Keynote, you will hear (and see) how to engage with your audience, and get your point across when it really matters. A sample clip of Phillip speaking. You would not buy from someone boring, so you must ensure that you, yourself, are not boring. This keynote will help you make your point in a structured way that gets agreement—and gets you noticed—in meetings, at conferences, in new business presentations. 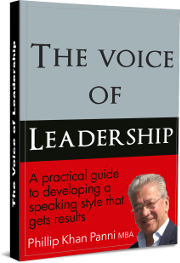 The most important element in leadership is superb communication skills. It’s not only about oratory; it’s about the sound of the voice as well. The process of persuasion is not the same all over the world, and sometimes a Yes is not a Yes. As co-author of Communicating Across Cultures , Phillip has insights to share.